From Gallery R and Paul Gauguin one was led into Gallery Q, a room devoted to the other two recognized leaders of post-Impressionism, Cézanne and van Gogh. The AAPS provided a short pamphlet on Cézanne, but many critics commented on the poor showing in the gallery: "The two important masters and fathers of the art-revolution, Cézanne and van Gogh, were quite inadequately represented by the number as well as the quality of their pictures" (Bluemner 31). Neither painter was given a full retrospective, and none of their strongest works were exhibited. Nonetheless, several paintings stood out among the rest. 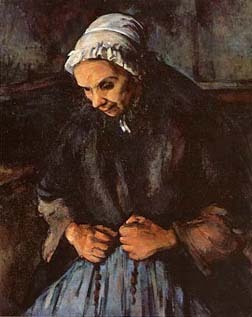 Old Woman with a Rosary (left) was perhaps one of the most memorable pieces from the Armory Show. Fifty years later, Paul Burlin cited Cézanne's work as the only painting he could remember: "The memory of its strange subjective manner stirs me even today, and I can visualize it on the floor, on the table, on the wall" (Munson-Williams-Proctor 95). Also present were several self-portraits and portraits of Madame Cézanne, which furnished an opportunity for viewers to contrast Cézanne's work from several periods. Studies like Harvesters and Four Bathers provide earlier examples of the geometric harmony Cézanne made manifest in later paintings like The Large Bathers. Cézanne, long overlooked by American collectors and art critics, finally received recognition from an American museum at the Armory Show, the Metropolitan Museum of Art. Alfred Stieglitz and Walter Pach had both recommended the museum hold an exhibition of his work; Stieglitz had gone so far as to write a letter to the trustees stating they "owed it to the American public" to show his work (Homer, Stieglitz 75). Though the decision was by no means unanimous, the museum did vote to purchase Hill of the Poor, now called View of the Domain Saint Joseph, at Bryson Burroughs' urging. The first Cézanne in an American museum, the painting remains in the Metropolitan Museum of Art's collection to this day.